The missile-detecting SBIRS Geo-3 satellite, which is scheduled to launch on Jan. 20, 2017. A U.S. military satellite designed to detect enemy missiles is scheduled to launch Friday night (Jan. 20), and you can watch the liftoff live online. If all goes according to plan, a United Launch Alliance (ULA) Atlas V rocket will loft the third Space Based Infrared System (SBIRS) satellite Friday at 7:42 p.m. EST (0042 GMT on Jan. 21) from Florida's Cape Canaveral Air Force Station. ULA will provide a live launch webcast via YouTube, beginning at 7:22 p.m. EST (0022 GMT). You'll also be able to watch the rocket launch here when the time comes, courtesy of ULA. The launch was scheduled for Thursday night (Jan. 19) but was pushed to Friday because of a sensor issue and the intrusion of an aircraft into restricted airspace. The aerospace company Lockheed Martin built the satellite, known as SBIRS Geo-3, for the U.S. Air Force. As the name suggests, two other SBIRS spacecraft are already aloft; SBIRS Geo-1 and SBIRS Geo-2 launched in 2011 and 2013, respectively. "SBIRS, considered one of the nation's highest-priority space programs, is designed to provide global, persistent, infrared surveillance capabilities to meet 21st-century demands in four national security mission areas, including missile warning, missile defense, technical intelligence and battlespace awareness," ULA representatives wrote in a brief mission description. Specifically, the SBIRS satellites help the military determine where enemy missiles launch from and where they are headed, ULA representatives added. SBIRS Geo-3 was originally supposed to launch in October 2016, but the liftoff was delayed while Lockheed investigated an issue with an engine component. 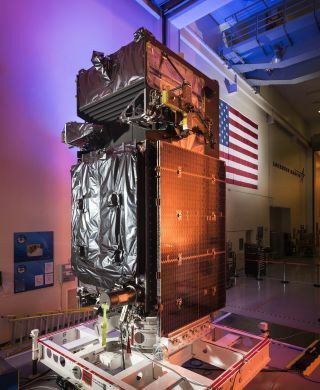 This issue arose on an unrelated satellite that features the same component, not SBIRS Geo-3 itself, Lockheed representatives have said; the latter satellite has been given a clean bill of health. A fourth SBIRS Geo satellite is slated to launch late this year. Editor's note: This story was updated late Thursday, Jan. 19, to include details about the launch delay and its Jan. 20 second attempt.